At 52,800 square kilometres, CKGR is the most remotely situated game park in southern Africa, and the second largest game reserve in the world. 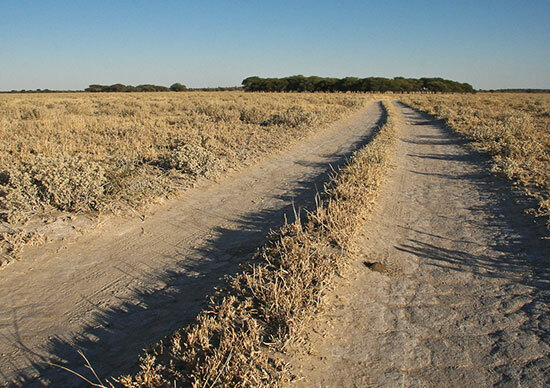 Its special features are the grassy pans of Deception Valley and Passarge Valley in the north, but its habitat ranges from dense bushveld and savannah plains – typified by silver terminalia, commiphora, acacia and Kalahari appleleaf – to very arid dune veld in its southern and western parts. Its remoteness makes getting there a challenge, which may explain why the number of park visitors rarely top 400 per month. Surprisingly, CKGR seems to attract more visitors from Europe than locally! From Gauteng you will need the better part of two days to make the journey to CKGR’s Matswere gate, given the joys and tribulations of overland travel through Botswana and into its remote parts where roads are often sandy, dusty and bone-jarringly corrugated. We made a week-long visit to CKGR and the surrounding countryside in late May. 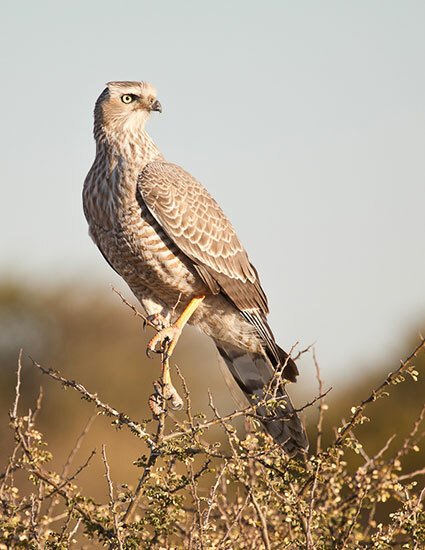 Autumn seems a good time to visit – it precedes the bitterly cold winter months and after good summer rains the veld was lush and rich, teeming with plains game and birdlife. 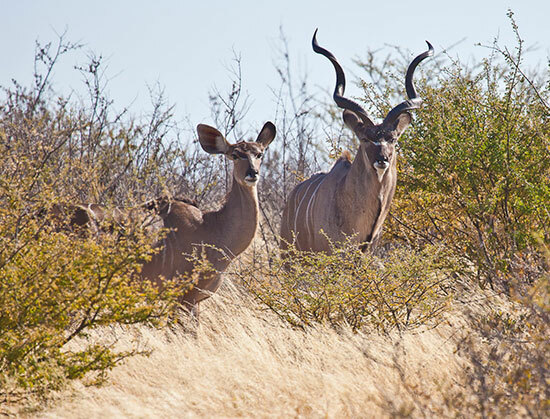 The park can be accessed from the south (via the Khutse game park), from the west and north-west (via Ghanzi, through the Xade and Tsau gates), or through its Matswere main gate about 45 km due west of the village of Rakops. 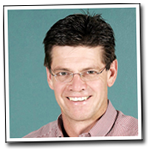 We chose the latter, and found good paved roads all the way from Pretoria to Rakops, where the sandy access road veers off west about 3 km north of the village. The roads in the park are all sandy, and mostly of the two-spoor variety. It needs a 4×4 vehicle and an experienced driver, and you must be self-sufficient as regards water, food, firewood and communications. The Passarge Valley camp sites, which we pre-booked, are at least a 3 hour drive (almost 100 km) from Matswere gate, and the only facilities are long drop latrines and bucket showers. 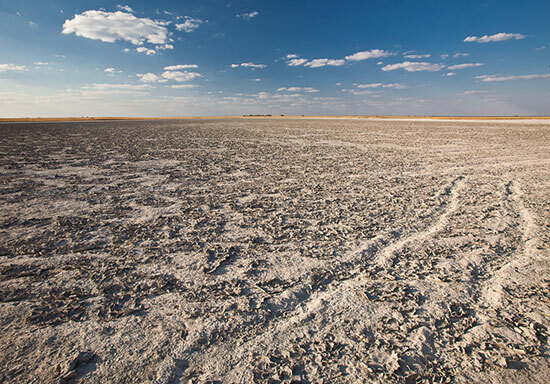 The first impression that hit us was the desolation of Deception Valley, which one reaches after about 40 km from Matswere. These grassy pans are remnants of an ancient river system and they stretch endlessly to the horizon all around you, the emptiness interrupted only by scattered clumps of camel thorn. It is easy to see how these pans were named – a thirsty traveller could be deceived into seeing a watery horizon in the mirages created by sunlight reflecting off the empty plains. 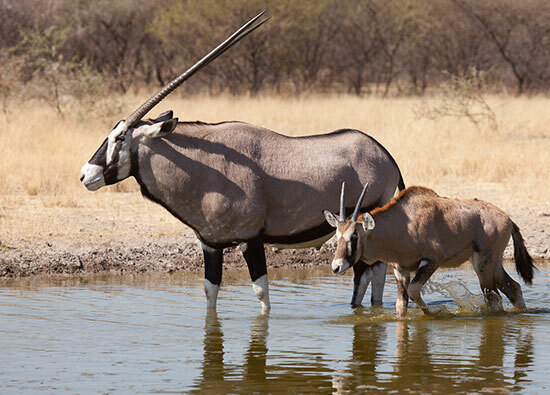 We were surprised to see an abundance of plains game – kudu, springbok, blue wildebeest, eland and gemsbok. Among the gemsbok we saw many small ones stumbling on uneasy legs behind their mothers, and we later learnt that gemsbok produce their young all year round. All the game was in wonderful condition – this is a land of abundance in good times. We saw some of the largest kudu bulls we had come across in a long time, with horns that will make a trophy hunter want to weep. But it was the birdlife and photography opportunities that drew us to this special place, and we were not disappointed. The scenery and changing vistas offered great variety for landscape images and early morning drives discovered secretary bird, kori bustard and korhaan (northern black and red-crested) in huge numbers. In one morning’s two-hour driving stretch we counted 16 kori’s doing their characteristic prancing around the pans. 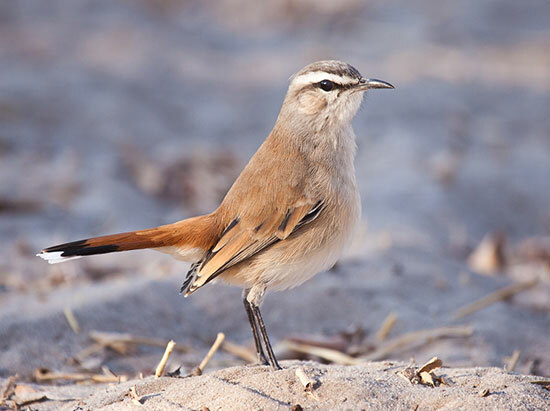 Smaller birds were ever-present: sabota larks, ant-eating chats, Marico flycatchers, scaly-feathered finches, white-browed sparrow weavers, Kalahari scrub-robin, black-faced waxbills, crimson-breasted bush shrikes and, of course starlings. Birds of prey were scarcer than we expected, except for white-backed vultures (the ocassional white-headed vulture has been spotted there) and pale chanting goshawks, of which we saw a magnificent sub-adult. 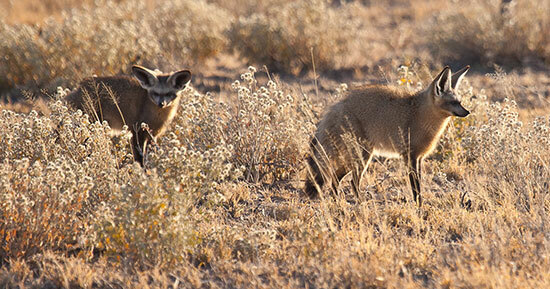 We spotted bat-eared foxes and honeybadgers every day as they foraged in the pans for their daily sustenance. Black-backed jackals made their presence known with their early-morning cries, and trotted around the pans just in case an unfortunate springbok met its fate with a leopard. This reminds me of a most unusual sighting we enjoyed one morning, a unique experience in many years of game viewing. A pair of jackal were making a nuisance of themselves and causing an irritation for three vultures who were hopping around what might have been a kill, some 200m away from us. The commotion reached a frenzy when a huge male leopard, tail curled in hunting mode, emerged from the plains grass and crossed the track ahead of our position, followed closely by the two jackal who were by now barking loudly, evidently to warn everybody who wanted to listen that mister big was on the hunt. Behind the jackal, in single file, was a herd of about 10 gemsbok, who brought up the rear of the procession as if wanting to make sure they did not miss any of the action. The leopard eventually disappeared into the tall grass to our left and life returned to normal in the pan again. It was a very special moment. From Passarge Valley we went on to spend two really great nights at Deception Valley Lodge just north of CKGR’s northern border. Its rustic but well-managed lodge, great food and comfortable chalet accommodation are a must-visit for the weary camper. The reserve, some 15,000 ha in size, has two prides of lion, some 25 animals in total, and together with sizeable numbers of kudu, wildebeest and eland, one is guaranteed some very special sightings. 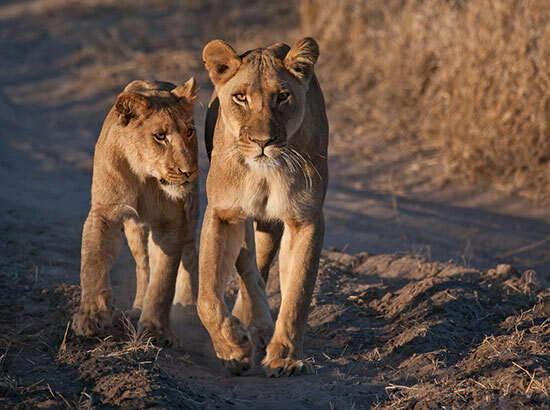 We had special moments, indeed – a lioness and her three one year-old cubs were spotted camping not far from the lodge, and we spent two very special drives watching them go about their business of grooming and resting. 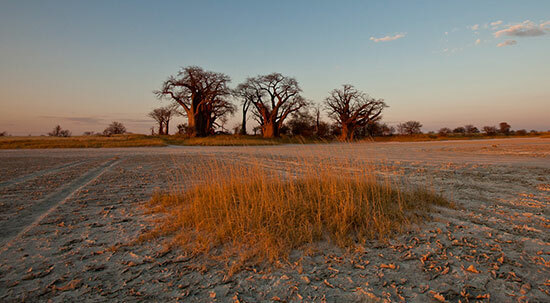 Our tour was concluded with one night’s camping at Baines’ Baobabs in the Nxai Pans Reserve. The fading light of day, the last few warm rays of sunshine, and the crisp early morning light on our last day in the pans created some very special photo opportunities. Our story about a short visit to the Kalahari will not be complete without a final note about the nights of absolute quiet and isolation. We remember so well a silence that is deafening to the ear, but soothing and healing at the same time. We think back to the isolation that makes all our other experiences so much richer and more memorable. And we remember the breeze that brushes over the Kalaharis’s pans, plains and vast stretches of savannah, whispering tales of man’s connection to creation. 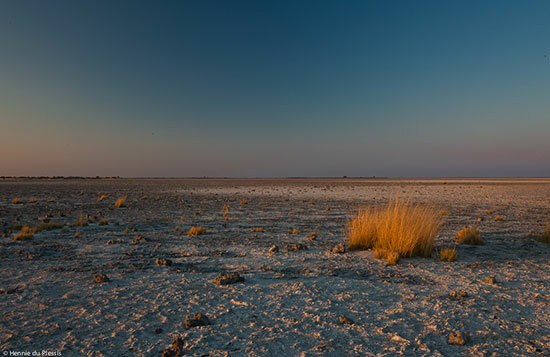 It will be very difficult to avoid the central Kalahari when we leave the city next time. The post Splendours of the Kalahari appeared first on ODP Magazine.